The accident took place after the Majerhat bridge in the crowded Alipore area caved in around 4.45 pm during rush hour trapping several people and crushing many vehicles. 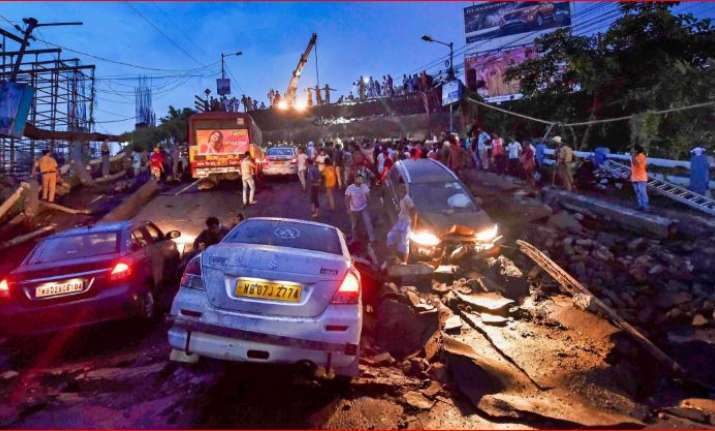 In a tragic incident, one person was killed after a section of a 50-year-old bridge collapsed on the arterial Diamond Harbour Road in south Kolkata. According to Kolkata police, one person was killed while 21 others were injured. The bridge runs over the Majerhat Railway Station and connects the city centre with the heavily populated Behala, vast areas of the southwest suburbs and neighbouring South 24 Parganas district. The deceased has been identified as Soumen Bag, a resident of Thakurpukur. Bag, in his late 20s, was returning home from College Street in central Kolkata after buying some books when the incident took place, according to the police. The injured have been admitted to SSKM and CMRI hospitals, the police added. Fire brigade personnel engaged in the rescue work had earlier said 25 injured were pulled out from the rubble. Additional lighting arrangements have been made to facilitate the rescue work at night. Meanwhile, a political blame game erupted in the state after the bridge collapse. The opposition parties alleged that the Trinamool Congress-led government's "callousness towards the repair of old bridges" was the main reason behind the collapse of a portion of the Majerhat bridge. BJP National Secretary Rahul Sinha blamed the state government for its alleged negligence in maintaining bridges in the state and demanded a judicial inquiry into the incident. "We demand a judicial inquiry into the incident and resignation of the CM and minister of the concerned department responsible for maintaining the bridge," he said. Senior BJP leader Mukul Roy said, "It is really unfortunate that the bridge has collapsed. But the fact is the state government is solely responsible for the bridge collapse. The issue of repair of the old bridges is not at all in the agenda of TMC government." "Earlier in 2016, we had witnessed a bridge collapse (at Burrabazar). This incident proves that the state government is yet to learn its lessons. The state government should give an answer," he said. Reacting to the allegations, Hakim said this was not the appropriate time to indulge in "politics over the incident". One minibus, four cars and a few motorbikes which were hit by the collapse were seen lying at the accident site till evening. An eyewitness claimed that some people in a minibus and private cars were trapped. Chief Minister Mamata Banerjee, who is now in Darjeeling, said that rescue work was almost over and only a concrete slab remains to be cut to find out whether any person was trapped there. Banerjee said that thousands of people pass through the area and the government has to probe the accident. “A probe will be done by a committee headed by Chief Secretary Malay De to find out the cause of the collapse. Action will be taken against those whose negligence caused the accident. No one will be spared,” she said. She also announced a compensation of Rs five lakh to the family of the dead and Rs 50,00 each to the injured. Banerjee said she will visit the site tomorrow cutting short her tour. Governor K N Tripathi, who visited the site, described it as “a big disaster”. “I have come to see the rescue work. It is a big disaster. I heard that maintenance of the bridge is entrusted with the PWD and the railways. The matter required to be enquired,” he told reporters. “We have to take into account the safety aspect while clearing the debris”, he said. The 450 metre-long bridge was built in early sixties and maintained by PWD, a member of mayor-in-council in the city municipal corporation said. Some locals alleged the collapse might have been due to the construction of metro railway pillars nearby but this was not immediately confirmed by the experts. Rail Vikas Nigam Limited, which is executing construction of the Joka-BBD Bag metro corridor passing through the vicinity of Majherhat bridge, said there is “no relationship of metro construction” with the incident. Urban Development Minister Firhad Hakim said the government would undertake technical inquiry after the rescue work is over. Asked whether the committee which look after the old bridges had given fit certificate to the Majerhat bridge, the minister said, “I cannot confirm it”. The bridge collapse hit Circular Railway services and local train services in Budge Budge-Sealdah line inconveniencing a large number of commuters, an Eastern Railway spokesman said here. The local train services were suspended from 4.45 pm, he said. The train services in the Budge Budge-Sealdah section at around 9 pm, an ER spokesman said. The army has kept three columns on standby for any assistance, defence sources said. Opposition parties blamed the Trinamool Congress government and said its “callousness towards the repair of old bridges” was the main reason for the collapse. “It is really unfortunate that the bridge has collapsed. The state government is solely responsible for it. The issue of repair of the old bridges is not at all in the agenda of TMC government,” senior BJP leader Mukul Roy said. This is the third bridge collapse in the city in five and a half years. An underconstruction flyover had collapsed in crowded Burrabazar area, the wholesale business hub of the city, on March 31, 2016 and had claimed 26 lives.